See in Glossary component carry over to Rigidbody 2D; the differences are that in 2D, objects can only move in the XY plane and can only rotate on an axis perpendicular to that plane. The Rigidbody 2D component appears differently in the Unity Editor depending on which Body Type you have selected. See Body Type, below, to learn more. See in Glossary are positioned. The 2D physics engine is able to move colliders and make them interact with each other, so a method is required for the physics engine to communicate this movement of colliders back to the Transform components. This movement and connection with colliders is what a Rigidbody 2D component is for. The Rigidbody 2D component overrides the Transform and updates it to a position/rotation defined by the Rigidbody 2D. Note that while you can still override the Rigidbody 2D by modifying the Transform component yourself (because Unity exposes all properties on all components), doing so will cause problems such as GameObjects passing through or into each other, and unpredictable movement. See in Glossary detection. Collider 2Ds attached to the same Rigidbody 2D won’t collide with each other. This means you can create a set of colliders that act effectively as a single compound collider, all moving and rotating in sync with the Rigidbody 2D. When designing a Scene, you are free to use a default Rigidbody 2D and start attaching colliders. These colliders allow any other colliders attached to different Rigidbody 2Ds to collide with each other. See in Glossary to move in a physically convincing way by applying forces from the scripting API. When the appropriate collider component is also attached to the sprite GameObject, it is affected by collisions with other moving GameObjects. Using physics simplifies many common gameplay mechanics and allows for realistic behavior with minimal coding. The Rigidbody 2D component has a setting at the top labelled Body Type. The option you choose for this affects the other settings available on the component. Note that although Rigidbody 2Ds are often described as colliding with each other, it is the Collider 2Ds attached to each of those bodies which collide. Rigidbody 2Ds cannot collide with each other without colliders. Changing the Body Type of a Rigidbody 2D can be a tricky process. When a Body Type changes, various mass-related internal properties are recalculated immediately, and all existing contacts for the Collider 2Ds attached to the Rigidbody 2D need to be re-evaluated during the GameObject’s next FixedUpdate. Depending on how many contacts and Collider 2Ds are attached to the body, changing the Body Type can cause variations in performance. A Dynamic Rigidbody 2D is designed to move under simulation. It has the full set of properties available to it such as finite mass and drag, and is affected by gravity and forces. A Dynamic body will collide with every other body type, and is the most interactive of body types. This is the default body type for a Rigidbody 2D, because it is the most common body type for things that need to move. It’s also the most performance-expensive body type, because of its dynamic nature and interactivity with everything around it. All Rigidbody 2D properties are available with this body type. See in Glossary, or indirectly via collisions and gravity. Body Type Set the RigidBody 2D’s component settings, so that you can manipulate movement (position and rotation) behavior and Collider 2D interaction. See in Glossary Use this to specify a common material for all Collider 2Ds attached to a specific parent Rigidbody 2D. Note: A Collider 2D uses its own Material property if it has one set. If there is no Material specified here or in the Collider 2D, the default option is None (Physics Material 2D). This uses a default Material which you can set in the Physics 2D window. 1. A Physics Material 2D specified on the Collider 2D itself. 2. A Physics Material 2D specified on the attached Rigidbody 2D. A Physics Material 2D default material specified in the Physics 2D window. Tip: Use this to ensure that all Collider 2Ds attached to the same Static Body Type Rigidbody 2D can all use the same Material. See in Glossary 2Ds to interact with the physics simulation during run time. If this is disabled (the box is unchecked), these components do not interact with the simulation. See Rigidbody 2D properties: Simulated, below, for more details. This box is checked by default. Use Auto Mass Check the box if you want the Rigidbody 2D to automatically detect the GameObject’s mass from its Collider 2D. Mass Define the mass of the Rigidbody 2D. This is grayed out if you have selected Use Auto Mass. Linear Drag Drag coefficient affecting positional movement. Angular Drag Drag coefficient affecting rotational movement. Gravity Scale Define the degree to which the GameObject is affected by gravity. See in Glossary Define how collisions between Collider 2D are detected. Discrete When you set the Collision Detection to Discrete, GameObjects with Rigidbody 2Ds and Collider 2Ds can overlap or pass through each other during a physics update, if they are moving fast enough. Collision contacts are only generated at the new position. Continuous When the Collision Detection is set to Continuous, GameObjects with Rigidbody 2Ds and Collider 2Ds do not pass through each other during an update. Instead, Unity calculates the first impact point of any of the Collider 2Ds, and moves the GameObject there. Note that this takes more CPU time than Discrete. Sleeping Mode Define how the GameObject “sleeps” to save processor time when it is at rest. Never Sleep Sleeping is disabled (this should be avoided where possible, as it can impact system resources). Start Awake GameObject is initially awake. Start Asleep GameObject is initially asleep but can be woken by collisions. See in Glossary Define how the GameObject’s movement is interpolated between physics updates (useful when motion tends to be jerky). None No movement smoothing is applied. Interpolate Movement is smoothed based on the GameObject’s positions in previous frames. Extrapolate Movement is smoothed based on an estimate of its position in the next frame. See in Glossary Define any restrictions on the Rigidbody 2D’s motion. Freeze Position Stops the Rigidbody 2D moving in the world X & Y axes selectively. Freeze Rotation Stops the Rigidbody 2D rotating around the Z axes selectively. A Kinematic Rigidbody 2D is designed to move under simulation, but only under very explicit user control. While a Dynamic Rigidbody 2D is affected by gravity and forces, a Kinematic Rigidbody 2D isn’t. For this reason, it is fast and has a lower demand on system resources than a Dynamic Rigidbody 2D. Kinematic Rigidbody 2D is designed to be repositioned explicitly via Rigidbody2D.MovePosition or Rigidbody2D.MoveRotation. Use physics queries to detect collisions, and scripts to decide where and how the Rigidbody 2D should move. A Kinematic Rigidbody 2D does still move via its velocity, but the velocity is not affected by forces or gravity. A Kinematic Rigidbody 2D does not collide with other Kinematic Rigidbody 2Ds or with Static Rigidbody 2Ds; it only collides with Dynamic Rigidbody 2Ds. Similar to a Static Rigidbody 2D (see below), a Kinematic Rigidbody 2D behaves like an immovable object (as if it has infinite mass) during collisions. Mass-related properties are not available with this Body Type. Material Use this to specify a common material for all Collider 2Ds attached to a specific parent Rigidbody 2D. Simulated Enable Simulated (check the box) if you want the Rigidbody 2D and any attached Collider 2Ds and Joint 2Ds to interact with the physics simulation during run time. If this is disabled (the box is unchecked), these components do not interact with the simulation. See Rigidbody 2D properties: Simulated, below, for more details. This box is checked by default. Use Full Kinematic Contacts Enable this setting (check the box) if you want the Kinematic Rigidbody 2D to collide with all Rigidbody 2D Body Types. This is similar to a Dynamic Rigidbody 2D, except the Kinematic Rigidbody 2D is not moved by the physics engine when contacting another Rigidbody 2D component; instead it acts as an immovable object, with infinite mass. When Use Full Kinematic Contacts is disabled, the Kinematic Rigidbody 2D only collides with Dynamic Rigidbody 2Ds. See Rigidbody 2D properties: Use Full Kinematic Contacts, below, for more details. This box is unchecked by default. Collision Detection Define how collisions between Collider 2D are detected. Interpolate Define how the GameObject’s movement is interpolated between physics updates (useful when motion tends to be jerky). Constraints Define any restrictions on the Rigidbody 2D’s motion. Freeze Position Stops the Rigidbody 2D moving in the world’s x & y axes selectively. Freeze Rotation Stops the Rigidbody 2D rotating around the world’s z axis selectively. A Static Rigidbody 2D is designed to not move under simulation at all; if anything collides with it, a Static Rigidbody 2D behaves like an immovable object (as though it has infinite mass). It is also the least resource-intensive body type to use. A Static body only collides with Dynamic Rigidbody 2Ds. Having two Static Rigidbody 2Ds collide is not supported, since they are not designed to move. Only a very limited set of properties are available for this Body Type. For the GameObject with the Collider 2D component not to have a Rigidbody 2D component at all. All such Collider 2Ds are internally considered to be attached to a single hidden Static Rigidbody 2D component. For the GameObject to have a Rigidbody 2D and for that Rigidbody 2D to be set to Static. Method 1 is a shorthand for making Static Collider 2Ds. When creating large numbers of Static Collider 2Ds, it is easier not to have to add a Rigidbody 2D for each GameObject with a Collider 2D. Method 2 exists for performance reasons. If a Static Collider 2D needs to be moved or reconfigured at run time, it is faster to do so when it has its own Rigidbody 2D. If a group of Collider 2Ds needs to be moved or reconfigured at run time, it is faster to have them all be children of one parent Rigidbody 2D marked as Static than to move each GameObject individually. See in Glossary that intersect are not registered. However, Static Rigidbody 2Ds and Kinematic Rigidbody 2Ds will interact with each other if one of their Collider 2Ds is set to be a trigger. There is also a feature that changes what a Kinematic body will interact with (see Use Full Kinematic Contacts, below). Use the Simulated property to stop (unchecked) and start (checked) a Rigidbody 2D and any attached Collider 2Ds and Joint 2Ds from interacting with the 2D physics simulation. Changing this property is much more memory and processor-efficient than enabling or disabling individual Collider 2D and Joint 2D components. Why is unchecking Simulated more efficient than individual component controls? In the 2D physics simulation, a Rigidbody 2D component controls the position and rotation of attached Collider 2D components, and allows Joint 2D components to use these positions and rotations as anchor points. A Collider 2D moves when the Rigidbody 2D it is attached to moves. The Collider 2D then calculates contacts with other Collider 2Ds attached to other Rigidbody 2Ds. Joint 2Ds also constrain Rigidbody 2D positions and rotations. All of this takes simulation time. You can stop and start individual elements of the 2D physics simulation by enabling and disabling components individually. You can do this on both Collider 2D and Joint 2D components. However, enabling and disabling individual elements of the physics simulations has memory use and processor power costs. When elements of the simulation are disabled, the 2D physics engine doesn’t produce any internal physics-based objects to simulate. When elements of the simulation are enabled, the 2D physics engine does have internal physics-based objects to simulate. Enabling and disabling of 2D physics simulation components means internal GameObjects and physics-based components have to be created and destroyed; disabling the simulation is easier and more efficient than disabling individual components. NOTE: When a Rigidbody 2D’s Simulated option is unchecked, any attached Collider 2D is effectively ‘invisible’, that is; it cannot be detected by any physics queries, such as Physics.Raycast. Enable this setting (check the checkbox) if you want the Kinematic Rigidbody 2D to collide with all Rigidbody 2D Body Types. This is similar to a Dynamic Rigidbody 2D, except the Kinematic Rigidbody 2D is not moved by the physics engine when contacting another Rigidbody 2D; it acts as an immovable object, with infinite mass. When this setting is disabled (unchecked), a Kinematic Rigidbody 2D only collides with Dynamic Rigidbody 2Ds; it does not collide with other Kinematic Rigidbody 2Ds or Static Rigidbody 2Ds (note that trigger colliders are an exception to this rule). This means that no collision scripting callbacks (OnCollisionEnter, OnCollisionStay, OnCollisionExit) occur. This can be inconvenient when you are using physics queries (such as Physics.Raycast) to detect where and how a Rigidbody 2D should move, and when you require multiple Kinematic Rigidbody 2Ds to interact with each other. Enable Use Full Kinematic Contacts to make Kinematic Rigidbody 2D components interact in this way. Use Full Kinematic Contacts allows explicit position and rotation control of a Kinematic Rigidbody 2D, but still allows full collision callbacks. 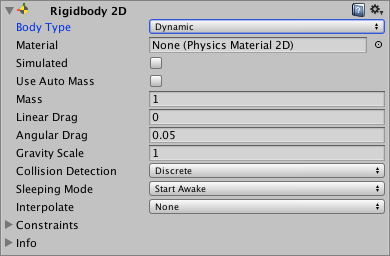 In a set-up where you need explicit control of all Rigidbody 2Ds, use Kinematic Rigidbody 2Ds in place of Dynamic Rigidbody 2Ds to still have full collision callback support.